SPANISH HORROR is a must for any fan of the terror subgenre. It was written by Victor Matellano (WAX, VAMPYRES, STOP OVER IN HELL) some years ago and he himself took it as the base for his Clawing! A Journey through the Spanish Horror documentary years after. It had been out of print for some years but luckily now it is again available in stores -not English friendly edition yet. 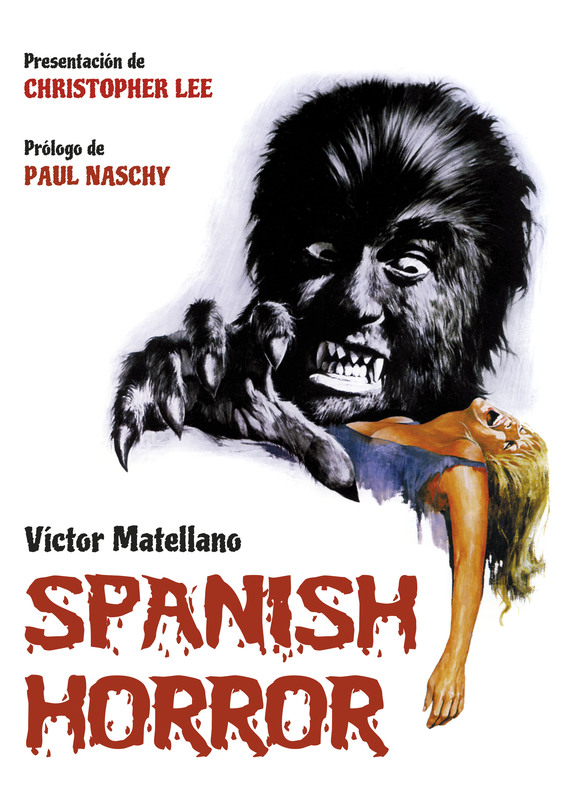 The book is introduced by Christopher Lee, who worked not only in Spain but for Spanish cult directors as Jess Franco and Eugenio Martín and the foreword was written by Paul Naschy, the one and only Spanish werewolf. The author focus on main directors and writers: Paul Naschy, Ibañez Serrador, Jess Franco, León Klimovsky, Amando de Ossorio, Larraz, J.P.Simon…. And tells all stuff around their flicks, adding crazy stories related to the lack of budget and the searching for money. This work does not only cover the golden age of our local thrills but it also includes parts dedicated to Enrique Carreras, the Spaniard who move to UK and founded Hammer Productions, together with extra data about new filmmakers such as Amenabar, Bayona, Balagueró and so. One of its most interesting features is the collection of pieces on cinema and TV main cult and modern classics and notes about our most famous scream queens and kings, being Soledad Miranda, Antonio Mayans…. In my opinion the most amazing segments are the chapters dedicated to producers and producing companies such as Profilmes or Pérez Giner and to FX masters, but what makes this book unique is all the information, never told before, about Talamanca del Jarama, a little place in the sierra of Madrid where tons of movies, Spanish features and Hollywood blockbusters, have been made. The layout is impressive; it is full of pics and quotations taken from old and new publications the author has been collecting throughout the years. SPANISH HORROR is not just a book for die-hard fans but also for newbies who want to follow the right path and know more about this amazing genre. I am going through this book as we speak! Much recommended. Is the book in English or Spanish?